The quest for the perfect female friendly car is not easy. So many manufacturers boast they meet every females needs, but I wonder if they actually speak to women and then produce the product they plan. 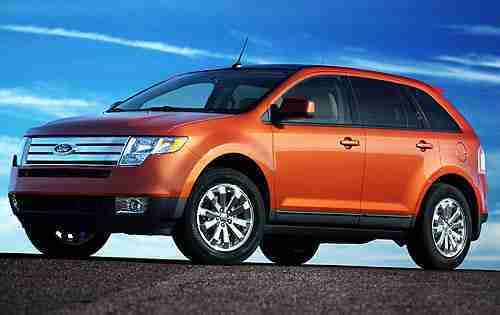 After driving the new 2007 Ford Edge, I think I’ve found the best all around female friendly car. Visibility and seating comfort are two of the most important factors women consider when purchasing a new auto, the Edge has covered both with the least amount of blind spots than I’ve seen in a long time, and comfort that should make any size and shape women comfortable. The bold new Ford Edge is in the red-hit crossover utility segment that offers dynamic driving character and innovative features designed to make it female friendly. Equipped with a 265 horsepower engine that give you power and fuel economy, plus a quiet ride that we all need. Most impressive was the standard safety features that other brands will charge extra for Edge includes: 4 wheel disc brakes with factory anti-lock brakes, side impact air bags, energy absorbing steering wheel and knee bolsters, safety canopy system for rollover protection, extended side air curtain, roll stability control, and Advancetrac® will give any women control of the road. After driving this impressive vehicle I was impressed with the handling as it wasn’t over assisted like many new cars and still give the flexibility of a SUV, yet graceful and a joy to drive. There is so much storage that you can actually put your purse or laptop in the center console that has adjustable storage, more cup holders that you can fill, four power outlets, pen holder, and even a tissue box holder. As for sound add your own with a MP3 adapter or listen to the factory Sirius radio – the sound was just as impressive. Every control, even the navigational system was easy to use even with acrylic nails. Most enjoyable was the panoramic vista roof, this large glass moonroof provides a grand view of the sky and can partially open as well as tilt or slide back. There is even a cover to keep the sun out of the kids eyes. This very responsive Edge offers drivers a confident ride without compromising the fun factor and gives women a new place to call their second home. All for a starting price of $25,900 for this sporty CUV. I’d recommend you take a trip to your local Ford dealer, you’ll get a lot for your investment.